"The car needs to sound the way it looks..."
If you happen to be a Finnish car enthusiast, you have most likely heard of the name Martelius. This rather uncommon surname represents more than just a close family living in Southwest Finland. It represents the most well-known and highly appreciated exhaust manufacturer brand in the Finnish car enthusiast and motorsport genre. We at CDLC.CO were more than happy when Martelius Exhaust decided to become our main companion for the season 2017. And naturally, we wanted to pay the guys a visit at their shop in Laitila and learn more about their craft. Digitally measuring the shape of the exhaust. It was early Spring as Niko and I started his Honda S2000 on one Friday morning. He had his summer setup on his Honda and for our surprise, it started to snow that very morning. Summer tires and snow is always a hazardious combination and we had Toyo Semi slicks under us. So naturally, we slowed the pace a bit, and got to Laitila a couple hours later. At the spot in the morning. The weather was typical Finnish flat gray. The main reason we decided to commute with the S2000 was because of a problem that the majority of fellow enthusiasts come by quite often. Niko bought an aftermarket exhaust from Toda in the late 2016. A true piece of art that exhaust was, but the tone was a bit off. Highway drone surprised us both while test driving the car after the installation. It was pure pleasure during a full acceleration, but as a daily driver, the deep hum was just too much in certain RPM's. Something needed to be done without risking the original Toda exhaust and its aesthetics too much. Who could've been a more suitable professional for that job than the guys at Martelius Exhaust? Taking the car in for the first look. We brought the car up and Arto Martelius took a closer look to the car's exhaust and the tone while Niko gave it a bit of a kick. Markus Martelius and his father, Arto, quickly understood the problem and suggested that they would add removable yet quite unnoticeable "trumpets" to the silencers for improving the exhaust flow around the tips. 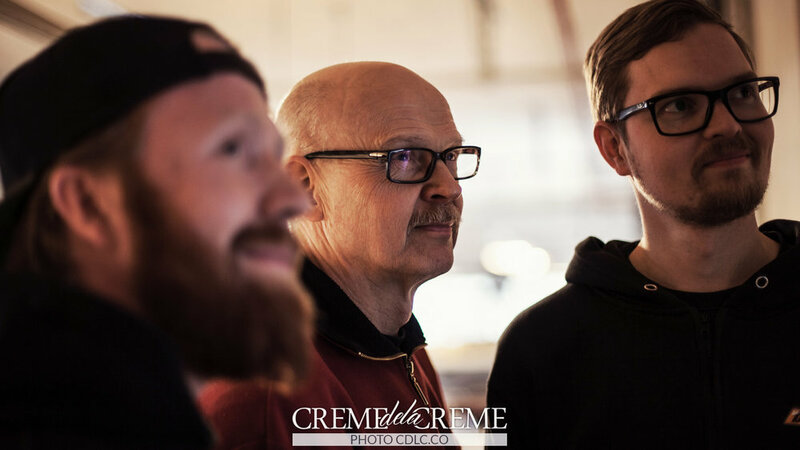 As Arto Martelius and the guys at the shop started to manufacture the trumpets, Niko, Markus and I had a change to get more familiar with the shop and their expertise and the interesting story behind the whole business. It all started from the love to the sport actually, both Markus and Arto say. A company that has been in business for over 30 years to date, was simply build on top of interest in motorsports and to the functionality of exhaust systems. Arto developed an interest towards racecar headers back in his study years. He wanted to design and build his own set after realizing that the British headers on the market were not performing as well they could have. The first headers by Arto were sold face-to-face to the drivers directly and quickly people started to hear about these new headers that gave extra ten horses, compared to the competition. The demand rose in a couple of years so that Arto decided to up the price a bit, for toning down the urge. The effect was the opposite and the demand went through the roof. The only way of answering the need was to make the side hobby into a full time company. What was thought to be an one time deal happened to snowball into what Martelius Exhaust is today. They have sold numerous sets of those exact headers, that have been experiencing evolution during the years. And that's what sets their expertise apart. The amount of endless interest towards evolving their products is simply breathtaking and their groundbreaking innovations speaks for themselves. They are currently developing tools, with Aalto University, for studying digitally the effects it has on the end noise of an exhaust when the structure, length and material of the exhaust is altered. It is a laboratory developed software which helps the team to understand what needs to be modified to change the sound into the wanted direction. Something that has been based of physical prototypes and testing, can be aided with digital prototyping in the close future by the help of Aalto University. Pretty cool indeed. Different sized tools for an automatic bender. And as you can probably imagine, the tools for this kind of job are not the ones you can buy from the wholesale. As we stroll around the factory, we stumble upon a machine after another that have been A. built by Martelius B. bought and then customized by them for suiting the job better. Benders, welding equipment & robotic welders, sheet metal tools, paint booths, polishing machinery... This place is a builders dream. For us, one of the more exotic equipments was this robotic TIG welder, which as you can imagine, made pretty sweet seams. It was very kind from the guys behind Martelius Exhaust to give us a tour from start to finish showing how the whole system works. From sheet metal and pipe delivery, through the measuring, bending and welding, to the finishing and all the way to packaging of the goods and sending them out to the customer. We were able to witness their knowledge and rapid actions when customers called or came by. The main thing was to please the customer as quickly as possible with a high quality product or a service. It was truly inspirational to feel the excitement and proudness they all shared towards the company. They always aim to understand and serve the customer's needs as well as possible. Someone wants to have a slightly more rumbling sound on their new daily and someone needs a full tailored setup for their race or a project car. 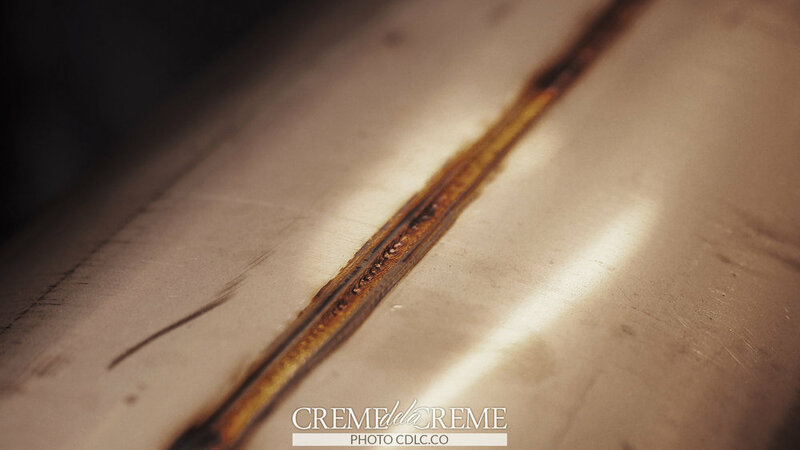 And that is the scope what Martelius Exhaust can provide. Markus says that the need for a full tailor work they provide has increased significantly in the past couple of years. People do have certain needs, that simply the aftermarket stuff can't always solve. Then the only option is to go full custom. The shop at Martelius Exhaust provides the basic "off the shelf" stuff. Like mufflers, exhaust tips, intakes, v-bands etc. Martelius Exhaust supplies aftermarket parts from Akrapovič, Magnaflow, Simons, Tanabe, MBRP and Supersprint, to mention a few. Below you can see one of their latest additions to the machinery, the polishing bath. This machine, like many of them, was customized to fit an exact job. At this point the exhaust modifications for the S2000 were getting really close for what Niko had in mind. We ate lunch at a local restaurant and tested the car out. The drone was already toned down significantly. A couple small tunes were made and the trumpets were attached by bolts underneath the Toda mufflers without compromising the looks. Somehow it feel that the trumpets gave a little "oomph" to the aesthetics as well. So no harm done there. The Toda exhaust sitting on a work bench, having the tips fitted. The workshop was full of different jigs from different ages, for different purposes. People who know Markus, know also that he is an avid car guy. His Silvia S12 is nothing short from legendary in the local race scenes. This R32 Skyline seen below has a bigger story than we would be able to fit in this context. But it sure was positive to hear that the car will hit the streets after many years of waiting in the garage. The petrol does flow in his parents veins as well and his mom drives this souped up FK2 Type-R, which has a fully built exhaust system by Martelius. More than once we stumbled upon a discussion about the people. Making excellent products would be impossible without the right people and the right enthusiasm. We felt a certain "one big family" thing going on at the place. Markus' right hand man, Lauri, keeps the front-end up and running, while the guys in the back do the design, manufacturing and testing. Like Lauri said, it is all about multitasking but doing it properly. These headers were just finished and sent out to the States. Markus at his desk sharing his latest visions. The guys: Lauri, Arto and Markus. What we learned today was that exhausts are tricky and the sound they produce are a sum of many things. Anyone can build an exhaust and make it loud. But the hard part is to make it serve the driver and the car wholesomely and to make the exhaust as good as possible in every section. We are all different and we desire different things. This is something Martelius Exhaust comes by very frequently. Some want it to look good, some want it to perform, some want just the right sound. Markus and his team does everything they can to provide the needed to the customer. A long story short, the Martelius Exhaust is a comprehensive and agile full service exhaust house. If you need anything from a small job, like we had, to a full blown tailored solution, they are the ones to contact. Like Markus said, they understand that people ask and have a need for different things. They face every customer as an individual and aim to please that certain need as well as possible. Markus' personal opinion is that the car should sound the way it looks and the sound is the most important thing in a car. For most cases in the automotive business, the sounds are very toned down, which fortunately fills Martelius Exhaust's calendars quite nicely.